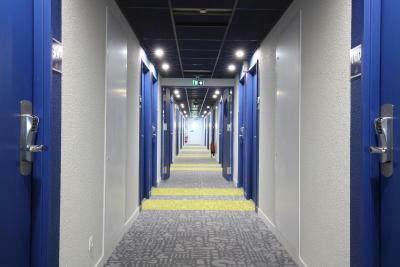 Lock in a great price for Hotel Ibis Budget Abbeville - rated 8.1 by recent guests. Great location, ideal for a stop off from the motorway, lots of places to eat within walking distance. Bed very comfortable. Room clean and well appointed. No criticism. The hotel itself is excellent. I had to do self booking in as I arrived in the evening, so it was not possible to assess the warmth of welcome. The lady in the morning was very good though, and breakfast was first class and very good value. Room was clean and modern, and comfortable, and tv and wifi very good too. The bed was comfortable, the room and the bedding was clean and quite suitable for an overnight stay. The hotel was conveniently located and close to local facilities. Clean, simple and comfortable. Shower was brilliant - disabled facilities were fine. Breakfast - we had fresh fruit salad ànd croissants- was lovely. Great for a stopover on route to somewhere else. No tea or coffee making facilities. Clean place with optional breakfast if you wanted it. Typical French room with twin bed and over the top single. Facilities in room Very comfortable bed. Bright clean shower. 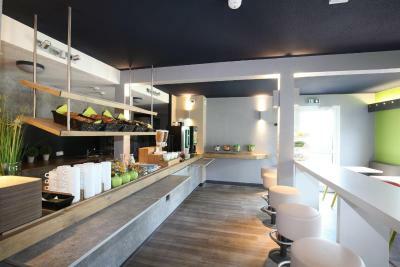 Featuring free WiFi throughout the property, Hotel Ibis Budget Abbeville offers pet-friendly accommodation in Abbeville. Le Crotoy is a 30-minute drive while Le Touquet is a 45-minute drive away from the hotel. The rooms come with a TV. All rooms include a private bathroom fitted with a shower. Paris Beauvais-Tille Airport is 46 miles from the property. 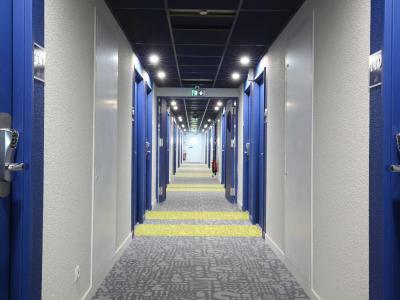 Hotel Ibis Budget Abbeville has been welcoming Booking.com guests since 6 Jan 2016. 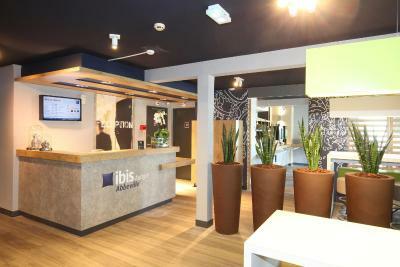 When would you like to stay at Hotel Ibis Budget Abbeville? House rules Hotel Ibis Budget Abbeville takes special requests - add in the next step! 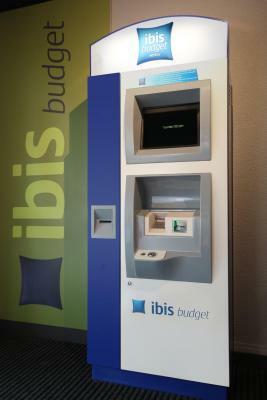 Hotel Ibis Budget Abbeville accepts these cards and reserves the right to temporarily hold an amount prior to arrival. Friday, Saturday, Sunday and public holidays from 07:30 to 11:00 and from 17:00 to 21:00. Check-in after 21:00 is possible using the check-in machine. Please inform Hotel Ibis Budget Abbeville in advance of your expected arrival time. You can use the Special Requests box when booking, or contact the property directly with the contact details provided in your confirmation. Room cramped for two persons and a pet. Breakfast rather spartan. Convenient location for motorized travel. Very small room, but typical for Ibis Budget. Located in an industrial/business park. Good value for the money. Clean room. Friendly staff. The signage - or rather, the total absence of it to this new hotel is absolutely dreadful, in fact non- existent! This is a very major problem. I arrived in the evening after driving 1000 Km and it took me about an hour of driving around, going into other places like MacDonalds to ask for directions. I speak reasonable French so that wasn't the issue. Lots of local people were unable to direct me. I even visited Ibis in Abbeyville, and the staff member I asked was really, on reflection, quite unhelpful to me. You need, as a matter of great urgency, to install signs at roundabouts and elsewhere in the area to assist guests. Even when I finally got onto the correct road for entrance, it is still not straightforward. While I would stay again, I would hesitate to try to direct any friends, or recommend d they use it as matters stand. N/a It was as described. Car parking spaces reduced due to ongoing exterior work. Too many commercial vehicles (large vans) in car park. Risk of damage to cars. Secure parking, although very busy. Car door dents always a worry! Very clean with great facilities. Pet friendly (dog) Staff very competent and welcoming.